After two wildly successful appearances in Universal Orlando’s Halloween Horror Nights, AMC’s The Walking Dead will return for a third consecutive year – a first for the event – and this time it will be inspired by Terminus, the mysterious location the survivors arrived at when Season 4 ended…and discovered it doesn’t seem to be the haven they hoped for. This year’s bone-chilling mazes will place guests at the heart of a harrowing journey to seek sanctuary at Terminus, an elusive destination that promises community for all. Mirroring the terror that befell the residents of the West Georgia Correctional Facility, now overrun by savage walkers, the experience will send guests fleeing from the fallen prison into unknown territory as they once again stage a desperate battle for survival against flesh-eating walkers and ruthless humans. The Walking Dead is based on the graphic novel written by Robert Kirkman and published by Image Comics. The series tells the story of the months and years after a zombie apocalypse. It follows a group of survivors, led by sheriff Rick Grimes, who travel in search of a safe and secure home. The Walking Dead is the number-one show on television for adults 18-49. AMC’s The Walking Dead returns for Season 5 this October. This year’s Syfy Digital Press Tour started a little differently – last year there was a low-key reception dinner just with the Syfy executives – this year it was a luau theme, complete with Hawaiian shirts, a fire dancer, and this time, with the talent! One of the first I met while waiting for it to begin was Rhys Ifans, the actor who has played a wide variety of roles such as a the crazy roommate in Notting Hill, “The Leg” in The Replacements, Xenophilius Lovegood in Harry Potter and the Deathly Hallows, Part 1, and now James Hook in the upcoming Neverland and Dr. Curt Conners/The Lizard in The Amazing Spider-Man. If you are at Universal Studios Orlando this Thursday, October 6th for Halloween Horror Nights 21, you can meet up for a Q&A and autograph session with Steve Gonsalves and Dave Tango of Ghost Hunters! The Ghost Hunters Q&A session begins at 8 p.m., followed by the autograph session at 9 p.m. at Pantages theatre, located in the Hollywood area of Universal Studios. Access to the Q&A and autograph session are included in regular admission to Halloween Horror Nights 21 on Thursday. Ghost Hunters has become one of the highest rated reality shows on Syfy Channel. The popular show follows Gonsalves, Tango and a group of real-life paranormal researchers as they track down the presence of paranormals across the country. With 19 nights remaining through October, Universal Orlando’s Halloween Horror Nights is the nation’s best and most intense Halloween event. 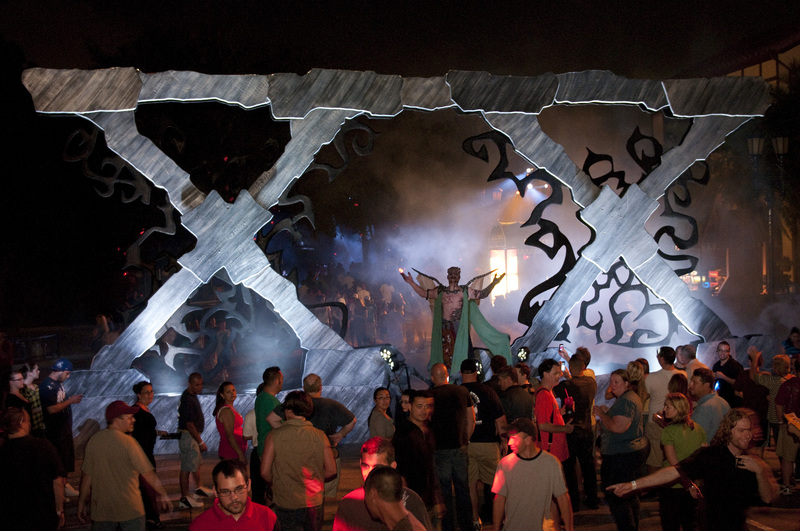 Guests confront extreme Halloween entertainment that cannot be experienced anywhere else. This year, they scream as they come face-to-face with a horrifying “thing,” panic as they are hunted by savage banshees, feel chills as they are surrounded by fiendish creatures from a third dimension – and watch in paralyzing fear as Lady Luck transforms from a tempting seductress to a bloodthirsty beast.